2. The surface is made of wetsuit fabric, which is soft and comfortable, and the inside is buoyant and lightweight. 3. 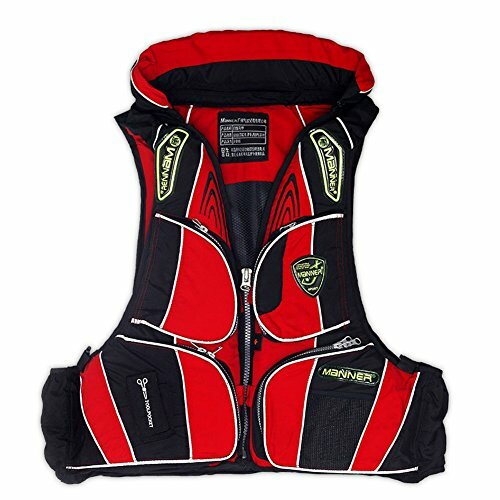 Detachable life jacket,with double buckle design,more follow your need. 4 . A life aid whistle,can help you call for help in emergency. 8 ) Scope of application : boating,surfing,fishing,drifting,swimming pools, yachts, etc. ◆HUMANIZED & INNOVATIVE & PRACTICAL DESIGN◆: Multi Pockets can be putted what you want. Flexible and Convenient Pockets on both sides of the chest. The outer layer of the back of is Good Quality fabric, can be folded, mesh lined. This unique design makes you cool and comfortable. ◆BREATHABLE & LIGHTWEIGHT & QUICK TO DRY◆: We obsess over customer experiences and happiness. Choose the Breathable,Quick-Drying,Ultra-Light Fabric.Made of Nylon Taslon and Mesh fabric; Features: Thin, Breathable, Light Weight, Durable, Quick-Dry.Suitable for Spring, Summer and Autumn(Fall). For all-day wear comfortably and freely,Fine Collapsible easy to carry. ◆OUTDOOR FASHION DESIGN & A PERFECT GIFT◆: You will feel outdoor sports style and leisure fashion,And love your look in the outdoor sport or travel occasion or adventure. Wearing this vest can make you more distinctive and fashionable with individual character. This Vest is also the perfect choice for gift giving. You could buy for Yourself and as Fantastic Presents for your Parents and Spouse and Friends. ◆USING OCCASION◆: It's not every season that you find a new favorite vest, but your luck is about to change! Ideal for Outdoor Sport such as Camping,Boating,Beach,Bike Cross-Country,Fishing,Travel,Hunting,Trekking,Photography,Hiking Or Gardening and etc.,There are so many ways to wear this vest depending on your protection needs and activity. ◆RESPONSIBLE AFTER-SALES SERVICE◆:Responsible and Best After-sales Service are provided. If there is anything wrong with your order,Please contact us, We will spare no efforts to deal with the issue immediately and carefully until you are satisfied.